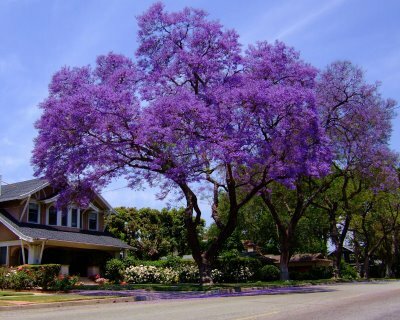 Every time I visit the Huntington Library and Gardens–which has always been in May and June–the beautiful show of blossoms continues into the streets of Pasadena. Lucky me! ← Fire, fire, go away, burn again another day. Southern California is my adopted homeland. It has landscape variety very few places enjoy: beaches, valleys, mountains, deserts and endless suburbs. Pasadena has beautiful boulevards, a good art museum, the Huntington Library next door and the Green brothers early 20th century architecture. It also has Cal Tech one of the best schools in the country. And more. Enjoy while you can and try to take in a concert with Dudamel next door. The last time I was at Caltech, I got into a conversation over dinner about air quality. A professor in the natural sciences happily told me about moving his family away from campus, up and out of the smog. He lamented having to drive, but it was just what he had to do for the health of his children. (That is, he pollutes other people’s children’s air in order to protect his own.) I’m sure it is just bad luck but this vignette adequately describes my experiences of the place. When I went out there (back in the last century) it was from c. April 10 until c. July 10, and May was beyond wonderful. A friend from the O.C. told me all about “June Gloom,” and I was like, yeah, right, whatever. Until June hit. I lived in central Pasadena and actually deliberately *walked* over to the Huntington five days a week, drawing a lot of silent scrutiny I’m sure. My bare arms were always freezing on the morning walk, but after a half-day in the Library– which I was figuratively spending in 18th Century England, with its “damps” and consumptives– I’d walk out for lunch and the gray mist was burned off and the San Gabriels were shimmering on the horizon. It always seemed miraculous to me. The walk back into town was much nicer. Wish I was out there now! Have a *great* conference, and do report to us leftbehinds!! My doctoral supervisor said that when researchers die and go to heaven, they find themselves back at the Huntington. I have to agree with his assessment: hope you’re enjoying a blissful time there! Awesome fucken restaurants in Pasadena! 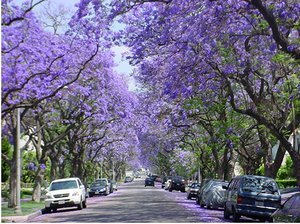 Ohhhhhh, I *miss* the jacaranda trees in bloom! Don’t miss the June gloom, though, that’s for sure. Looking forward to the Great Convergence this weekend! And while you’re in California: take time to stop and smell the jasmine. This will be the highlight of the year for me. And I am not at all being ironic. So nice to see you at the Omohundro conference! Any ideas you have for a “historians and microhistory” festival, let me know!